Yesterday, in one of my classes, we were asked to shortly describe ourselves. My classmates’ self descriptions stated their country of origin and their current profession. So that would make me: Samara, American, studying TESOL in Thailand. How very weak that introduction is. How void of the most important parts of my identity. Samara. Daughter of God. Created to create. Loved to love. Accepted to accept. I would say that that more accurately describes who I am. Jesus and I will be celebrating our ten year anniversary pretty soon. Ten years. A whole decade. I cannot believe I’m old enough to be celebrating a decade of anything… but that is a whole other issue. With this memorial date approaching I’ve been doing a lot of reflecting. Every time I hear myself say this something jumps inside of me. That statement is the most true statement I can make. Nothing has had a more profound impact on me, my life, and who I am, than my relationship with Jesus. I grew up with christianity. I grew up with the stories, the rules, the systems, the commands, the expectations… but I didn’t grow up with the reality of the Gospel. It wasn’t until that Reality became my reality that I was able to experience the freedom that has forever marked my life. I recently finished reading “The Jesus Storybook Bible” with my Thai teacher. If you haven’t invested in this children’s Bible yet, you’re missing out. I have yet to find the Gospel more beautifully illustrated (figuratively and literally). The authors of this Bible have so beautifully pointed out how God has been working from the beginning of time to get His children back into right relationship with Him. Every story whispers Jesus’ name. For God SO loved the world that He sent His Only Son. It was always God’s plan to send Jesus. Because it was always God’s plan to get His children back. And who does Jesus pinpoint? Who does Jesus call out for greatness? Who does Jesus choose to befriend? He chose people like me. People who were lost, depressed, lonely, dirty, poor, addicted, deserted, alone, condemned, guilty, hurting, oppressed, possessed, angry, blind, deaf, dumb, doubting, drunk… the list goes on. He chose whomever would chose Him. He chose the hungry. He chose the needy. He chose the difficult. The unrighteous. The annoying. I’ve been a missionary for about three and a half years now. Demonstrating the Gospel is my job. Literally. It’s what I get paid to do. So often the job demands of newsletter writing and supporter relations tempt me to act like an Extra-Super-Holy-Person. I mean… that’s what missionaries are supposed to be, right? My life needs to be clean. structured. organized. predictable. newsletter appropriate. and those knees better be covered… do we even need discuss the shoulders? My paycheck depends on it… right? For God SO loved the world that He sent His One and Only Son, that WHOMEVER may believe in Him will be saved and have life eternal. So that’s my Gospel. Believing in Jesus and receiving that life eternal. Life eternal starting ten years ago. Life eternal now. On earth. Life eternal full of messes and mistakes and unexpected turns and hiccups and high highs and low lows. And that’s what I am in Thailand to share. Not a good English education. Not an introduction to critical thinking. Not an education full of the creative arts. I’m here to introduce my friends to Life Eternal. Right now. Life with Whom you may converse. Life with Whom you may walk. Life with Whom you may be messy and unpredictable. Life—Who will never change, never leave, never reject. Life with Jesus. Free. Safe. Abundant. Not much I can say after that. So to end this blog post I want to challenge myself to another ten years. Another ten years of Life. Another ten years of greater intimacy and greater depth of relationship. Another ten years of walking with Jesus wherever He may bring me. Another ten years of saying yes to impossible situations and messy people. Another ten years of taking risks and looking foolish. Another ten years of failing and hurting. Another ten years of Jesus picking me back up. Another ten years of Abundance walking with me. Protecting me. Guiding me. Providing for me. Another ten years of adventure. And I challenge you too. I’ve been on a bit of a Graham Cooke kick lately–specifically his message titled, “Inheritance” (which, if you have never listened to–or just haven’t listened to it in a while, you should click here and have a listen before reading on). This message has had a profound impact on me over the years, but recently, the truths God speaks through Cooke have been running through my head on repeat. With the help of my Thai teacher, I translated Cooke’s message into Thai and have shared it at church, in the art studio and in one on one prayer sessions with my Thai friends. The School of Promise (SoP) recently held their annual English camp which I volunteered to help at. During a planning meeting we were discussing the objective of the camp and trying to come up with a camp theme. As this message has become a staple in my spiritual life, I suggested, “God loves you 100%”. I talked a little about Cooke’s message, said that I had it translated in Thai and suggested that we read it to the kids and base our ‘spiritual time’ on this message. My colleagues liked the idea and we designed camp around this theme. Camp went well. The kids listened to Cooke’s message, a couple of teachers shared testimonies on how the revelation of God’s great love has changed their lives and we had an activity where the kids wrote out the things they don’t love about themselves, nailed those to the cross and them proclaimed God’s 100% perfect love over all our short comings and imperfections. All in all, I would say it was a successful camp. On the final day of camp, one of the SoP teachers stopped to thank me for sharing what I had shared with the kids. She told me that she really loves this particular Graham Cooke message and will often share bits and pieces of it with Thai unbelievers. She told me that she loves telling people, “God loves you 100%,” but that after sharing this she often feels remorse because she worries that if we stress God’s great love to sinners–while they are still walking in their sin–how will they ever feel conviction and change their ways? “He (God) loves you 100%, He won’t love you any better when you become better. He loves you 100% right now; and even if you have no plans to become better, He will still love you 100%, because He loves you, because that is what He is like. And even if you don’t want to change, He will love you 100%. Even if you have no plans to walk with Him, He will love you 100%. These truths directly contradict the idea that we need to stop sinning in order to receive God’s love and salvation. Through out my conversation with the SoP teacher I began to realize that while she really wanted to believe this message–it had yet to become a truth to her. Throwing the words “universalist” and “heretic” around do tend to make people uncomfortable. But more and more, I feel like these may be words that the majority of mainstream christians would use to describe me. After living in Buddhist country for three years and being forced to learn how to connect with God without all the christian lingo/ideology/iconography that has surrounded the first seven years of my walk with God–my idea of who God is and how great His love is has expanded. It has been forced to. These sorts of situations begin to challenge ones views on eternal damnation for not accepting Christ in your life. God loves you 100% right now. at the same time; meanwhile. during the time that; at the same time as. While we were still sinners, Christ died for us. Before circumcision was law, Abraham was justified by God. Before the disciples believed who Jesus was, they were chosen to do great works. It seems that, more and more, performance and religious rituals have taken the place of justifier in the church. That the free gift of salvation is only free as long as it’s followed up with a devout, religious, holy, sinless life. I can not believe this. If righteousness comes through performance, Christs’ death is worthless. Christ paid the price. 100%. End of story. Christ’s death covered my past sins. Christ’s death covers my current, repeated sins. Christ’s death covers my future sins, my unbelief and my incomplete theology. Is his death not enough for my buddhist brothers? So. Maybe I’m a universalist heretic? Maybe you’re going to be worried about my theology and praying for my mind to renewed…and for my salvation. Maybe this is just a phase that I will grow out of (like obsessing over cats or drawing pictures of robots). But in the meantime, I chose to stand on and believe in God’s perfect love. I chose to believe that nothing will draw people into God’s family in a more complete and authentic way than their experiencing the infinite love of the Creator. And I choose to honor the Lover God by loving those He loves–even when they don’t (won’t) love Him back. He loves you because He loves you because He loves you because He loves you because He loves you because He loves you because He loves you because He loves you because He loves you because He loves you because that is what He is like. I was really worried about writing this post, knowing that it may be slightly controversial in a couple of places. I do want to make it clear that I still very much believe that Jesus is the One way to life eternal and I believe in hell. The Bible seems clear about these facts. I, however, believe that we, in our christian minds, send people to hell much more readily and freely than God does and that it is God’s greatest desire to see all of His children honored with Christ in heaven and that He will pull out all the stops to get everyone of us with Him. I do not, necessarily, believe that sin sends us to hell. Every single one of us will die in our sin–even conscious, repeated sin (gossip, unforgiveness, half-truths…etc, etc, etc…). But rather, I believe that some, having experience God’s ridiculous love will still chose to reject Him and chose hell for themselves. I am also aware of my youth and ignorance and incomplete revelation of God and am willing to be refined in my understanding as I continue to walk with the Lord. If you are not already aware, Tracy Lorensen can do anything. Seriously. She is the kind of person who will say ‘yes’ to anything and then excel at it. She is strong, disciplined and highly responsible. In many ways, Tracy Lorensen is the exact opposite of Samara Marie. I mean we have our similarities…don’t get me wrong. Youtube videos, small nicknacks and pretty things in general have bound our two [very] different personalities into an eclectic friendship that has shaped me for life. That being said… “If Tracy Lorensen can do it, I can too” is not a motto I mold my life around. Like I said in a previous blog (with a similar title), Tracy is made up of the combined essence of Aquaman, Thor and the Amazing Flash. You could probably add Wonder Woman in there for good measure. That’s hard to keep up with. Trying to keep up with that could result in entering into a dangerous spiral of comparison and self-pity. Don’t go there. It’s not pretty. That being said, I have found myself, once again, taking on a new feat along side the one and only Tracy Lorensen. About a month ago Tracy found out that she had a candida** overgrowth problem that was wrecking havoc and causing all sorts of ruckus on her insides. In order to get rid of the all consuming candida (which is just a fancy word for yeast) inside of her, Tracy needed to completely change her diet, cutting out all forms of sugar (natural or added), dairy and simple carbohydrates (bread, pasta, rice, oats, etc). It needed to be a complete overhaul. Right at the onset of the holidays. My empathy, unsolicitedly, won and I decided that I would do it with her. As a support. And that’s where I want to end this blog. Because that’s where I look good. What a good friend you are Samara. Yay you! The End. Turns out…this was much harder than I was expecting. Thank you Jesus for Caleb Lorensen who has been like a live in candida killing chef. Preparing us all sorts of sugar free, dairy free, gluten free dinners. If it wasn’t for him I would starve. The first week on my new diet I was lost. I had no idea what to eat. I never realized how much of my diet was composed of carbs and sugars. Carbs and sugars. Carbs and sugars. Carbs and sugars. If you ask me what my favorite foods are, the only honest answer I can give is: carbs and sugars. I quickly realized that most of my food choices were based off of convenience and that I regularly gave into sugary cravings. I was addicted to sugar. No doubt about it. The sugar cravings came hard and then my body punished me for not giving in by sending me a massive headache that lasted days on end. The lack of sugar made me grumpy and emotional. while I was writhing in my bedroom over a snickers bar that I couldn’t indulge in or curling up in the fetal position lamenting over the woes of my life. I was an awesome support system. That is a good questions and there are a couple good answers for it. I am incredibly stubborn. I am proving to someone (probably my inner critic) that I can indeed do this. It turns out, I had a pretty horrible diet before this. I never realized it. I mean, I eat a ton of vegetables and my meals are all mostly good for me and nutritious…but between those meals, I would eat a ton of crap. It was mindless snacking. My food decisions were impulsive and often driven by my emotional state. Coming to that realization was hard, but has been a driving factor keeping me going. I want to rid myself of this unhealthy addiction to bread and sugar and stop looking to foods for comfort or joy when I should be looking to Jesus. Finally, it turns out, I probably have a bit of candida overgrowth myself and actually feel a lot better (now that my sugar withdrawal is done) not eating the carbs. My digestive system has needed the break and I find that when I mess up and eat something I shouldn’t, I end up with stomach issues. So, I’m keeping it up. Not with the strength and vigor of the Superhuman best friend that I live with, but with my dramatic, whiny personality that is too stubborn to give in. ***Die off is when the candida in your body has been starved to death so it emits all these toxins in a last ditch effort to destroy you and you feel miserably ill until the toxins are gone. Fun stuff. I didn’t learn how to ride a bike until I was ten; my childhood was –colorful– up to that point and well, learning how to ride a bike wasn’t high on the priority list. My brother and cousin, however, were given the opportunity to learn at the normal age of six and I, amid the beauty of prepubescent awkwardness, decided to join in on the fun. A ten year old’s body is different than that of a six year old. It’s bigger. More clumsy. Uncoordinated. Etc. Samara learning how to ride a bike was far from elegant and could best be described as inept. My best friend at the time was WAY into bikes. Her dad had a bike shop in the garage, each member of the family had a top of the line bicycle, the family owned a tandem bike and they participated in the Ragbrai bike ride across Iowa each year. This was a family of bikers. So–in order to keep up with the Jones’, or in this case, the Rowell’s, I was determined to learn how to ride. …it’s just that I would just fall. Like I would just stop peddling and tip over. Peddle peddle. stop. flop. Let’s just say, I was never quite a ‘natural’. So there I was, the young and impressionable, bike riding Samara–ready to take on the world with my helmet hair and cool biking gear. There I was, at least, until the dreadful day in 6th grade. My brother and cousin took to bike riding much more naturally than I did and unfortunately for me, they knew it. Even more unfortunately, they were little punks about it. I could generally ignore their punk-i-ness by living in the Sunshine land that created for myself early on as a coping method for unpredictability and chaos, but this day was different. The kids had been riding their bikes down a steep grassy hill located behind the church, across the street from my aunt and uncles house. I had been watching them accelerate down the hill, listening to their wails of delight, but I had not even considered joining in on their madness. But then the taunting began. I was able to resist for awhile, but as the older and obviously much cooler 11 year old, I couldn’t stand in the face of their immature ridicules long and I decided to go for it. I strapped on my helmet, got on the bike and sped down the hill. Everything was going fine until I panicked over the momentum I was gaining and squeezed my handle bar brakes in a moment dismay. Naturally my ever graceful body did a balletic spin over the handle bars landing me onto the ground with my bike laying next to me. I died. I knew it. Or worse. 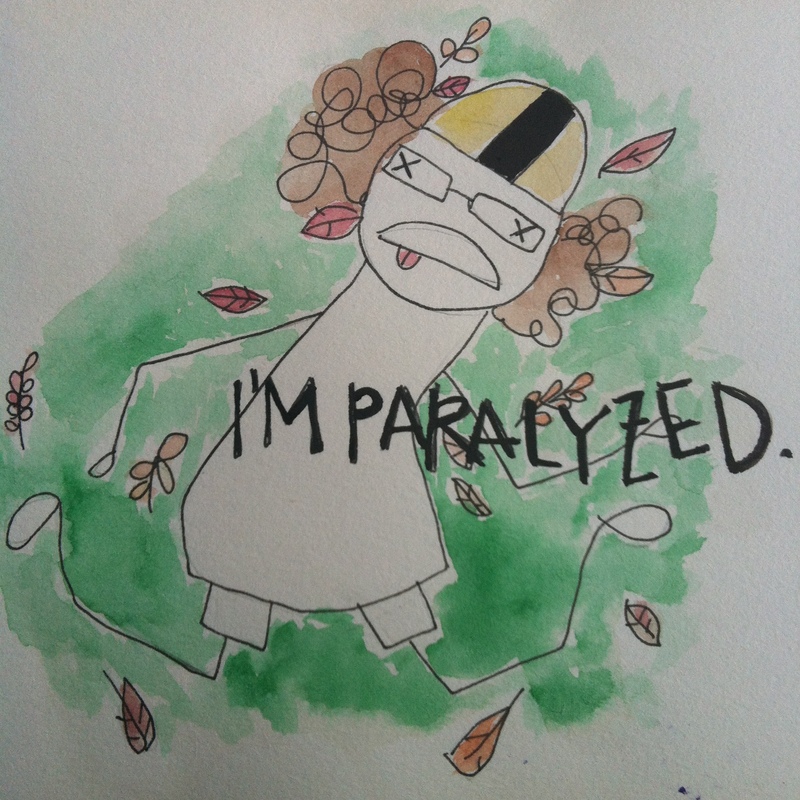 I was paralyzed. As I was so completely convinced that I was either dead or paralyzed, I couldn’t move to get help and therefore my cousin had to go get her mom and my aunt literally drove the van down the hill, took the back seats out and lifted me in. I rode to the hospital laying on the floor in the back of my aunt’s van. A couple hours at the hospital and a few X-Rays later we found out that I was going to make it after all. A minor wrist sprain and a few stitches in my mouth–but I was going to be just fine. At least physically. 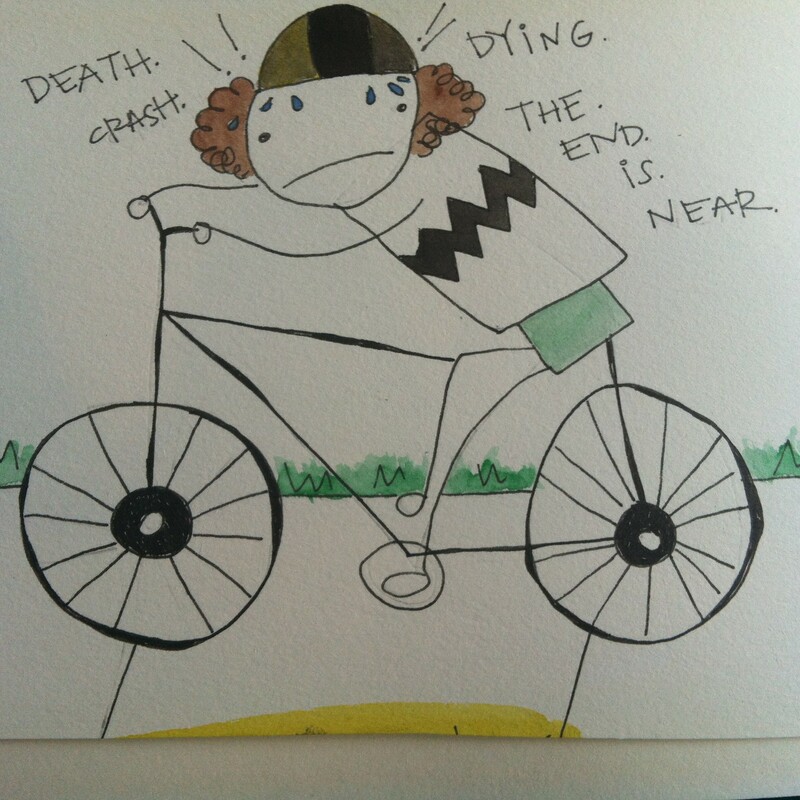 Psychologically, I was traumatized and decidedly never getting back onto a bike again. My car broke down and after learning that public transportation doesn’t actually exist in Omaha, (at least not with any efficiency,) I decided the best way for me to get to my coffee shop job at 5:20am was via bike. I had been gifted a bike not long before and the old adage, ‘it’s like riding a bike,’ was ringing in my head, so I was completely confident in this idea. That was, of course, until I got on the bike. and fell. and fell. I couldn’t get balanced, I couldn’t get my feet on the peddles and I surely couldn’t go down any hills. I could not do this. ‘It’s like riding a bike.’ To me, this equals death. Fortunately, one of my then roommates was (is) a saint and she agreed to re-teach me this age old skill. If I was nervous, awkward and scared as a ten year old, you can multiply those emotions by 14 and that is an equation that, again, leads to… death. But my friend persisted. She held onto my seat and promised not to let go and then let go and I fell. Over and over and over. Until, at last, I was able to ride my bike to work. I, however, was never able to call myself a ‘confident rider’. 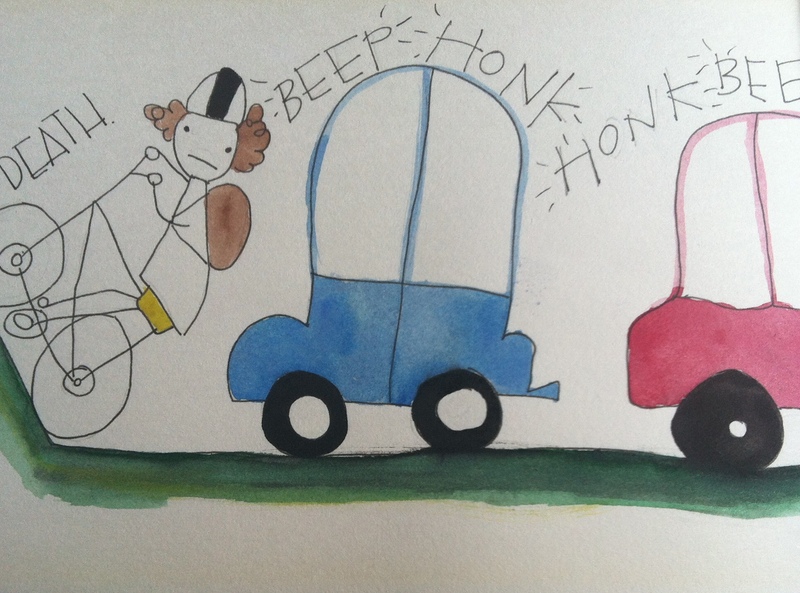 While I always made it to work and back, I refused to bike on the street and was convinced that I was constantly riding into danger and facing impending DEATH via bike accident. And then I moved to Thailand with the Lorensens. This family is made up of avid bikers and lovers of all things scary and hard. So, of course they had me biking to a market within the first month of being in town. Soon there after, I purchased my own bike and while I was greatly distressed at first, I rode it. In the beginning, my bike rides only took place on the back roads, but eventually I made it out onto the crazy, overloaded, hustling and bustling Thai roads–I even began to ride my bicycle to Thai class when I had alternative transportation options. 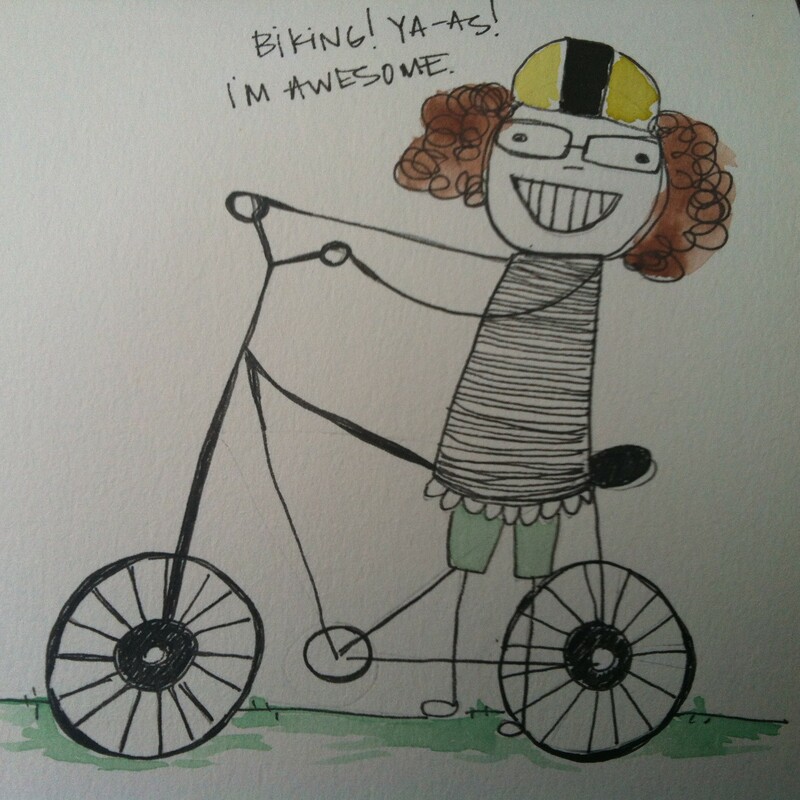 Samara, at the ripe age of 27, became a confident bike riding babe. I was recently in the States for three months of resting, relaxing and library hopping. As per my usual, I had a lot of car drama during these three months and was therefore out of a vehicle on a couple occasions. Once again, providence shined down on me and I was loaned a bike. This fearless biking mama was totally into the idea of peddling around Omaha. Hello hipsters. Here I am. I buckled my helmet, put on my backpack, tied my Keds and was off on about a two mile journey to my church’s office building. My biking, hipster babe fantasy bubble lasted a whole three minutes until I actually got on the bike and was reacquainted with my former fears and a few new foes called hills, gears, cars and cold. That bike ride can only be described as DEATH HUMILIATION. THE CARS!! Instead of just zipping past me amid my struggles up the hills (as any Thai person would do) they patiently waited behind me—only to increase my feelings of shame and anxiety. Basically all the awkwardness and blunderings of my ten year old paralyzed self came flash flooding back into my psyche and I never got back on that bike again. But hey, now I’m back in Thailand where the weather is warm, the traffic is crazy and for some reason, here, I can ride a bike like a pro. If Tracy Lorensen can do it, I can! This is not a motto I mold my life around. Know why? Because Tracy Lorensen can do anything. Yes. She’s like a hybrid of Aquaman, Thor and the Amazing Flash. I’m not even joking. So yea… I do my best not to compare myself with her. Yet somehow, somehow, I find myself training for a half marathon with her. Often, as I’m putting in the required amount of training miles, I relive the day that I agreed to this absurdity. There had been no prior talk of Tracy running the half, in fact, I was under the impression that Tracy didn’t particularly like running… but without any prior thought, the word “Great!” was blurted out of my mouth as if an alter ego had momentarily taken over my body and mind. And that was it. Mere seconds after that word tumbled out of my mouth I was registered and the registration fee was paid for out of my eager team leader’s pocket. I had trained for and ran a half marathon before. The training process, while vigorous and exhausting was actually kind of enjoyable for me. I did all my long runs with a close friend and I found various other different people to do the short runs with. Well promises are made to be broken? Right? Right? So, here I am again. The first two months of training were actually ok. Tracy and I would go on our runs together and used the month of January to get our bodies used to running…so the runs weren’t long or fast, just nice. Knowing that Tracy was soon getting on an airplane for the States made these runs very special to me—something I looked forward to (read ‘looked forward to’ with the understanding that there was still a fair amount of moaning and groaning on my part,) they were part of our busy schedules that I knew I would get exclusive time to just spend with Tracy. I mean, I always knew it was going to happen. Always. It was never a secret. It wasn’t a surprise. And you know what didn’t leave? The fact that I needed to train for this freaking half marathon that is haunting my future. Tracy left and in her place came this giant cloud of smog covering the entire province of Chiang Mai. Public service announcements about not exercising in the current weather conditions were aired and thousands of Thai people began wearing masks while they drive their motorbikes trying to keep the toxins out of their lungs. At this point, my body has pretty much rejected me. 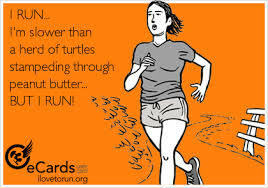 I have dealt with every runners ailment you can think of. From runners knee to lost toe nails to nasty blisters to chaffing… flipping chaffing. Chaffing chaffing chaffing. The night before my long run, I went and hid bottles of water along my trail. Genius. The next morning as I was running along, my little self was just soooooo excited about these hidden oasis’ that I would stop, thirsty or not, and gulp down some water. Five times I did this. And then, blump blamp blomp, went my stomach for the rest of the run. Still not sure which was worse…total dehydration and inevitable heat stroke, or the pure excitement I had over the hidden treasures that, in turn, led me to running with a stomach that was getting closer and closer to vomiting at every step. Meanwhile, Tracy is growing stronger everyday in Omaha continuing her training like the graceful gazelle she is. As my miles continue to take me longer and longer to accomplish, hers, it seems, are taking her less and less. Change the wording a little to read: “What Tracy looks like when she’s running”… the rest can stay as it is. This week, I’m supposed to take off. I had a small procedure done in my armpit (I told you my body has turned against me,) and the doctor said I’m not allowed to sweat. Ha. Normal Samara would be all, ‘BooYah! !’ but something strange has happened to me and I feel kind of gyped out of my precious training time. I have yet to process these feelings… they are new and confusing to me. So here I am. In Thailand. Alone. Training to run the Lincoln Half Marathon on May 3rd. Because, if Tracy Lorensen can do it, I totally can too! I’ve been wanting to write a blog on singleness for a long time, but was having a hard time articulating my thoughts. Fortunately, God knows how much I like telling stories, so I was recently part of a very ‘interesting’ situation that has allowed me to create this blog. I’m an almost 28 year old female which therefore results in my singleness being a regular topic of discussion. My reaction to people’s comments and questions vary greatly depending on the person making the comments and my current level of annoyance. I am typically able to get over my annoyances after a brief rant with my roommate, but after this recent experience, I decided it’s time to put my words out there. The School of Promise recently hosted a male substitute teacher for two weeks, while one of our teachers was in America. He was a man, my age, very handsome, well dressed, well off and… believe it or not, single. He came to Thailand solely to help us out for the two weeks and therefore had no other responsibilities–no team, no where else to be. Saying this dude was ‘available’ was an understatement. The matchmaking attempts began immediately–and being honest, I was fine with that. This situation (a single male coming to volunteer at the school,) is such a rare occurrence that I wanted to take advantage of it and get to know him. I quickly (after our first one-on-one hangout) realized I wasn’t interested in this person. While he was handsome, yes, and easy to talk with, we had extreme differences of opinions and world views. Our convictions on how to live our lives did not match up at all. But, wasn’t opposed to hanging out with him on a friendly level while he was here. It’s at this point that things started getting annoying. The staff at the school could perceive his apparent interest in me–he was very intentional and sought out time with me as much as possible–so their chatter, gossip and speculations were swirling around the school. I had been married off. One person was even kept up at night because she was having ‘anxious dreams’ about me leaving the school and moving to this fellow’s country. I didn’t really want to talk about him while he was still working at the school, so I let the comments slide for a couple days, but also tried to let the teachers know that I was not interested in him and that we were just friends. The story ends with me having to be incredibly firm in my ‘dis-interest’ in this man and while he was willing to marry me and take me away from Thailand… I let the marriage train pass me by. But, In all seriousness–I don’t understand. I don’t understand why marrying someone who is completely incompatible with you is more desirable than living the single life. I see and understand the draw of marriage–it is a good and beautiful thing, finding someone to walk as partners in life with—but, I also don’t see marriage as the end all of life. I don’t see marriage as a goal to work towards (winks to my team leaders…) and I don’t see singleness as a stamp of living an unfulfilled life. Singleness is not a synonym for loneliness. Nor is my being single a punishment from the Lord for my not being ________ enough. My being single just means that I’m single. Honestly, I (maybe controversially) don’t believe that marriage is a promise from God. It is probably one of my biggest pet peeves in life when people quote Psalm 37:4 to me as a ‘cure’ for my singleness. You know what, the deepest desire of my heart is not marriage. The deepest desire of my heart is to look more and more like Jesus. And I do believe that He will fulfill that desire…though I’m very far from having arrived. I am single. I am 27, and I’m okay. I’m more than okay, I’m happy. I’m living my life fully, I’m saying ‘yes’ to the opportunities in front of me and I’m trying to follow Jesus’ leading in my life. And I am definitely not someone you should pity. All this to say, I am not anti-marriage, nor am I going out of my way to stay single, however, if I never put on that white dress and walk down that coveted aisle, I will be just fine. I will continue living my life confidently and securely as a powerful woman of God. I’ve only ever had one recurring dream in my life and both times the dream left me screaming and bolting out of my bed to find safety. What was this dream? Oh… that my life was covered in spiders. I don’t hate spiders. I abhor them. This evening I was happily organizing the art supplies at Sunshine Studios and getting ready for tomorrow morning’s class when out of the corner of my eye I see him, Mister Freakishly Huge and Hairy Scary Man Eating Spider. Oh and where exactly was Mister Freakishly Huge and Hairy Scary Man Eating Spider? Not up in the corner like a good little man eating demon… no, no, he was nonchalantly sitting on the edge where the wall meets the floor–approximately four inches from my hand. I speedily fled the room leaving him with my computer and my fan (two of my most beloved belongings) and called Tracy who was studying with our Thai tutor. Our Thai teacher was able to quickly disembody the nasty demon but with no lack of high pitched screaming and award winning high jumps from me. *The whole time this was happening I was believing the spider to be a tarantula, as I’ve never seen a spider so big and so hairy before… My Thai teacher kept referring to the spiders as a แมงมุมยักศ์ which literally translated means: giant (as in ogre…) spider. I googled it in Thai to see if it was actually the Thai name for a species of spiders (like ‘tarantula’) or just an adjective. Turns out, it was just an adjective and Mister Freakishly Huge and Hairy Scary Man Eating Spider was not a tarantula, but a very well fed huntsman spider. Well, for whatever reason the pictures aren’t loading properly, and since they’re really gross and I don’t know how badly I even want these pictures on my blog… you can just do your own google image search of ‘thai huntsman spiders’. **Note: Throwing up is an appropriate and acceptable response. ***For more of how I feel about spiders you can go here and then here. The next morning I had to teach classes at Sunshine Studios so I literally opened the building up and made one of my students do a thorough search of the rooms before I would enter in. There have, thankfully, been no new intruders since. In 2011, after returning from the World Race, I needed some…um, special attention? That 11 month trip around the world altered things inside of me that I did not expect to have altered; parts of my personality were chiseled into a new version of myself and ways that I responded to situations was no longer the same. A lot of good things came out of that whirlwind experience. I learned the importance of using my voice, I learned some of the qualities of a good leader and I met some of my most dear friends. I also came home from this experience incredibly depressed. Depression, while not at all a friend, became a constant companion in my life. Beginning the last couple months of the World Race my new companion taught me how to withdrawal from relationships and shut off my emotions. Being welcomed home by all my friends and family wasn’t an easy task. I knew that they had missed me and I had missed them too, but with my new companion I wasn’t exactly very engaging. No one was expecting me to bring this companion home and I wanted to avoid their questions, so for the first couple months of living in America I pretended that I came home alone. Oddly, while I was going through the motions of christian life in America, I was also walking through the process of becoming a church planter to Thailand. Through the early stages of this process, the church leadership thought it important for me to get some help sorting through what was going on inside of me. That’s when I met Norma. I can remember our first meeting so vividly. I was scared, cold and walled off; she was bright, open, full of love, light and warmth. I felt safe. I didn’t know Norma–had only seen her at church and heard her name, but something about her set me at ease. I knew that with her I did not need to pretend. Somehow, the things I said to her didn’t scare her away. She wasn’t scared of my companion, of my pain, of my mess. Instead she loved me, listened to me and taught me. I left America, still holding onto the fingertips of my trusty companion, but have since been able to let go completely and through a lot of grace and relearning how to trust my Papa, have been freed completely from it’s influence. During one of our first meetings at the Tea Smith, Norma asked me what was one of the hardest things for me during the World Race. Simple enough question…I can still write a pretty substantial list without thinking too hard, but that day, for whatever reason, I told Norma that the hardest thing for me was the incredible difficulty in finding loofahs. a coarse, fibrous cylindrical object used like a bath sponge for washing. It consists of the dried fibrous matter of the fluid-transport system of a marrowlike fruit. the tropical Old World climbing plant of the gourd family that produces these fruits, which are also edible. Norma tucked that answer of mine–sarcastic as it may have been–and kept it in her heart, never making mention of it again. On the day of my departure from America to Amsterdam and then to Thailand Norma gave me a tearful hug and a gift bag that said not to open until my birthday, which was about four days away. I hugged her and thanked her and boarded my plane. I celebrated my birthday in Amsterdam with two good friends and there opened my gift from Norma. My friends thought this a strange gift, but I didn’t, Norma was making sure that I would have what it was that I had lacked before. Upon my explanation one of my friends gave me four more loofahs to take to Thailand, just in case. A couple days later, when I settling into my new bedroom, I noticed the welcome note Tracy left for me on my vanity, along with a loofah. That did it. I had received six loofahs over a week. I thought it incredibly hilarious, but also felt like there had to be something behind it. So I asked Papa if He was trying to tell me something. Daughter, the things that you have lacked in the past, I am giving you now in abundance. I let that resonate and chose to believe it. As life moved on and settling into Thailand happened, I would often catch myself believing that I live in lack, when that kind of thinking settled in, I would call myself to remember the lesson of the loofah. I’ve lived in Thailand for a year and a half now and have received seven more loofahs from Norma. Each time one come in the mail or is delivered by a visitor I have a good laugh to myself and thank God for His abundance. Over the past couple months my storehouse of loofahs has dwindled. We’ve had various people come live in our house for differing amounts of time and I have opened my supply to them and then forgot one at the condo we were staying at when we went to the beach. I noticed last week that I only had one loofah left. I had been awaiting a package from my gramma for a couple weeks now. I had ordered a t-shirt and was therefore very excited to get this package. Gramma told me that she threw in a few other goodies, but I didn’t know what to expect. When I opened my package I was greeted with three ‘natural sponges’ and a new loofah. What a laugh, what a gift. What a specific gift from Papa. Gramma had no idea about any of this, no idea about the lessons of the loofah or about my current belief of lack. To her, she was just sending me a loofah. But so real and special to me all the same. No lack of patience. No lack of peace. No lack of creativity. No lack of ideas. No lack of resources. I have no lack of relationships. No lack of opportunities. Instead, I am a daughter. Completely loved, completely provided for. Completely seen. Completely known. Completely complex and completely understood. 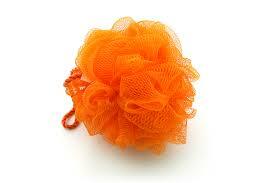 All this heart revelation and from a loofah. Sometimes, as a teacher, I just fail. Well, the reality is that sometimes I just fail period… but it’s amplified while I’m teaching because I have a constant crowd of witnesses. 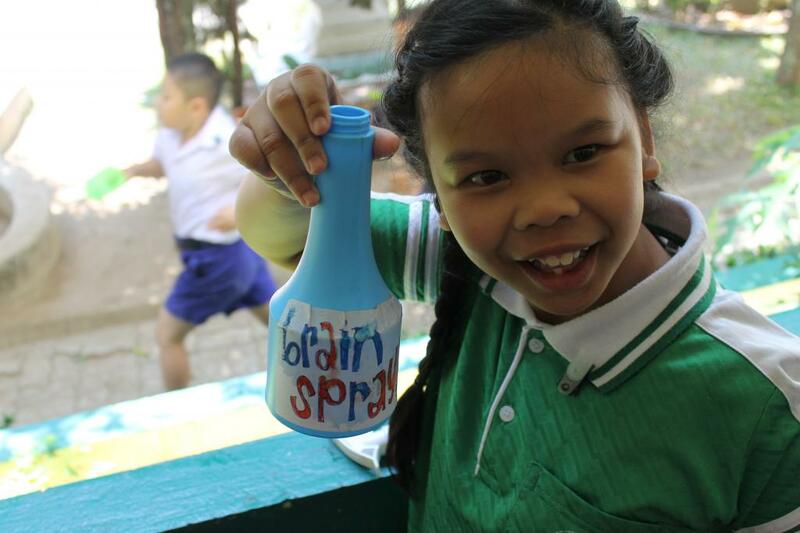 **BRAIN SPRAY** is a magical concoction made of coconut oil, water and sprinkles. **BRAIN SPRAY** has been specially formulated to help decrease student stress while taking tests and thus helping them to preform better. Results are guaranteed. I have been using this **BRAIN SPRAY** on my students whenever we have a big test, which, unfortunately, is much more frequent than it should be for first graders. Well, the last week of school should be a time of fun and games, but at the School of Promise we have to take finals. In e v e r y s i n g l e subject. Finals. So, out comes the **BRAIN SPRAY**. The kids know the drill and actually quite like getting sprayed by the magical concoction. So, they line up, cover their eyes and let me spray their faces. However, this particular day–my last teaching day of the year–things didn’t quite go as planned. This time, instead of growing in confidence and wisdom, my students started falling on the floor, gagging. I watched as the first couple students react like this, but thought they were being weird and dramatic so I just ignored them and proceeded to spray the entire.rest.of.the.class. Soon I noticed all of my students on the floor, not just the dramatic ones and decide that something must be askew. 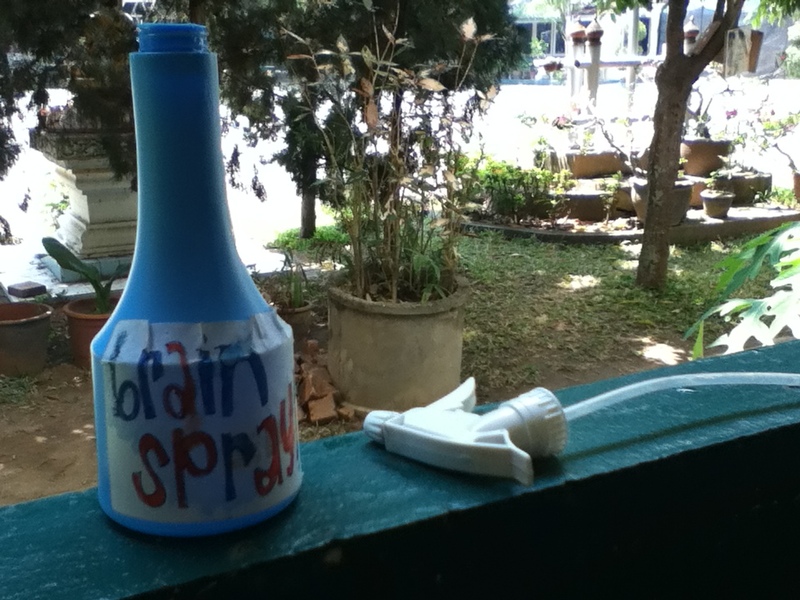 Turns out that after about a year in the classroom, my bottle of **BRAIN SPRAY** turned rank. I mean rank. pungent. fetid. reeking. noxious. My **BRAIN SPRAY** was stankin’! And I sprayed that rank, pungent, fetid, reeking, noxious, stankin’ **BRAIN SPRAY** on each of my students faces. I teach first level English. Most of my students are 6-7 years old, from Buddhist families and prior to this school year have never been introduced to the Kingdom of God. Most of them, when they go home, have no one to discuss matters of the Kingdom of God with, no one to reinforce what they are learning about this great God of Love, no one to affirm their young faith. In fact, most of my students, when they go home, are strongly discouraged from believing these stories and expected to keep the tradition of Buddhism in the family. 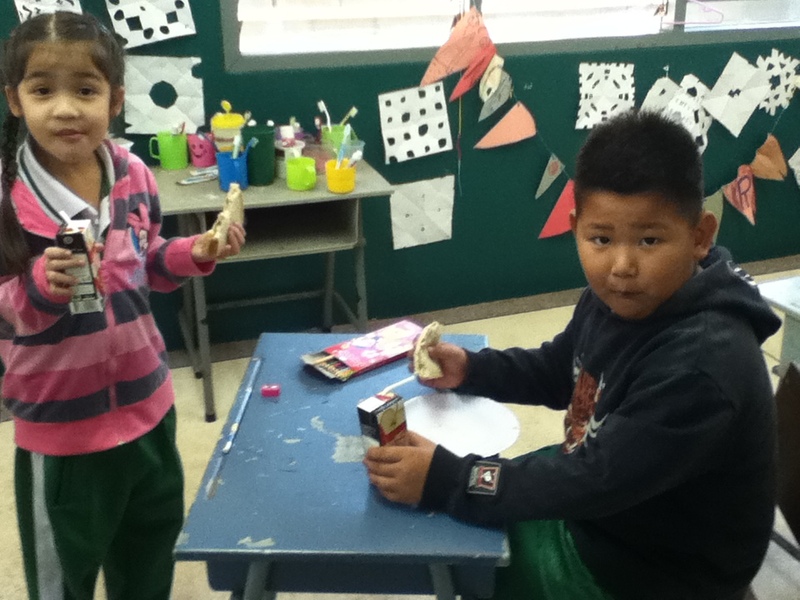 I teach first level English… how much can they really understand anyway? I start each morning off with Bible and prayer. 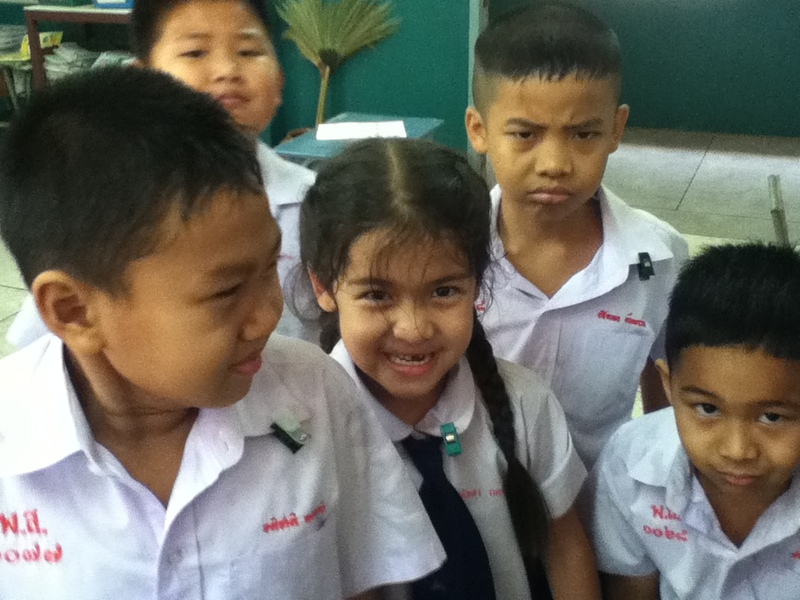 The school provides a Bible curriculum with memory verses and stories that the Thai teachers and English teachers should be teaching together. I followed this structure for about the first semester, telling the great stories of the Christian faith and emphasizing the Character of God along the way. I taught about relationship with God, about freedom in prayer and against methodical religion. I also made it a habit to lay my hands on each student and declare the truth of God over their lives. Around semester break, something began to shift. I would come to class with a general idea of what the Bible theme was and what I was going to teach, but would end up teaching about something completely different. Each morning I would walk away stunned at the depth of conversation I was having with my students. But something even more profound than our conversations was unfolding before me. This little man was one of my main criers for the majority of the first semester of the school year. I didn’t really know what to do with him and his habitual crying, so I would just let him be. After semester break Folk was a new, little man. I’m not sure what to attribute this change to, but he stopped crying and went from being my lowest performing student to being in the upper half of the class. He also started wanting to pray. Whenever the opportunity presented itself to pray for a fellow student or situation, Folk was the first to volunteer. I had taught one class about Jesus healing whomever was sick around Him and how Jesus tells us to do the same. I explained the laying on of hands and that if the Spirit of Jesus lives inside of us, Jesus says we will do the same works as Him, and greater works yet (John 14:12). Then, I asked the students that weren’t feeling well to stand up and those of us who were feeling well would pray for them. I led that one prayer. Folk was one of the students that prayed and that day a fire caught inside of him. Anytime a classmate was sick, this 7 year old, buddhist boy, would go over, lay his hands on their body and ask Jesus to heal them. It has been astonishing to watch him walk out his young, un-jaded faith. Bootay is one of my rascaliest students. He is very intelligent, very funny and very naughty. He’s tough, he’s creative, he’s the life of the party–everyday. Yesterday Bootay wasn’t feeling well, by morning break he was in tears due to his stomach hurting. Bootay is not a crier. I asked him if he wanted to go to the office and call him mom, he said ‘no’ and that his mom wouldn’t come pick him up. I asked him if he wanted to go to the office anyway and he refused. 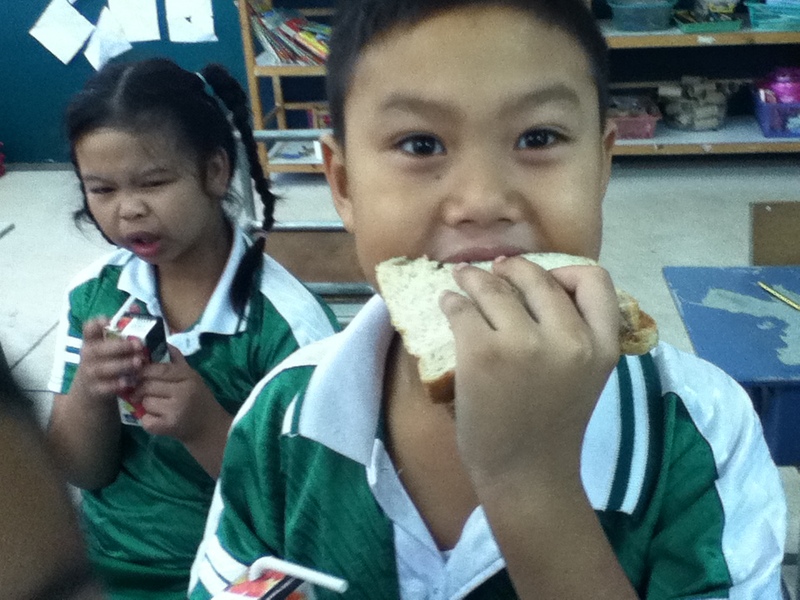 He left my class in tears and went to get his morning snack. Caleb and another teacher noticed his silent tears due to his stomach ache and urged him to go call to his mom. Bootay didn’t budge, he just stood there in pain. At the beginning of the next class period I told Bootay to go rest on the floor in the back of the room and asked Folk to go pray for him. I wish I would have taken a picture of this. Bootay was laying face down on the mats in the back of the room and Folk was sitting on a chair, hands folded solemnly asking God to heal his friend. While this is going on in the back of the classroom, I stood in the front talking to the rest of the students. I gave them the run down for the period and told them that Bootay wasn’t feeling well, if any of them wanted to pray for him they could join Folk in the back. All of the students went and laid hands on him and prayed until they were done. One by one the students returned to their seats and started with their projects and Bootay was left in the back of the room resting. Ten minutes later Bootay was 100% better. He came and told me that God healed him and then started doing the project with his friends. By the end of the class another student was complaining of a headache so Bootay faithfully prayed for him in order to pass the blessing of healing on. This is only one of the stories of crazy things God’s been doing in my classroom and with this school year coming to an end and a new year with new students on the verge, I anticipate many, many more.